"Firmware upgrade encountered an issue" - Here's the Solution! Most Android users refrain from getting involved with stuff like rooting and flashing ROMs simply because they are afraid of getting their phone or tablet bricked while trying to do so. I think it is a wise decision not to play with things one is not familiar with. I still remember how my hands quivered and heart bounced while rooting my first Android phone, the Galaxy S. Those terrible moments when every step to root the phone made me believe that it would be bricked, still thrill me. Using your phone the gentlemanly way without ever dreaming of rooting or installing a third-party ROM might be justified to a certain extent. However, the question still remains— is your device safe if you depend solely on official updates sent from your phone’s manufacturer? Custom development activities might lower the chances of your device getting into trouble, but disdaining them does not guarantee that it will be safe against bricking, or rather soft-bricking! Remember, keeping to the right side of the lane does not guarantee your safety! Whatever reason might be responsible for the firmware upgrade issue, the outcome is certainly not pleasant. 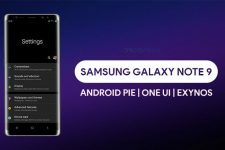 The most popular solutions used by people for solving the issue after facing that screen are entering the device into Download Mode and install the firmware again, and booting the device into Recovery mode and wiping data/factory reset. Unfortunately, both these remedies do not help in most cases. If you are viewing this page, I assume you have a device suffering this issue, or you someone who wants to keep himself updated with solution for such problems. Please be warned that following the procedure given below will wipe all data stored on the internal storage of your device and installed apps. Download and install Samsung Kies on your computer if you do not have it already installed on it. Note down your phone’s Serial number somewhere. You can find it under the battery of your device or the box your brand new device came with. Enter your device model name in all CAPS (GT-I9500, for example) and click on OK.
Then you will be asked to enter the Serial Number of your device. Once again, select OK on the next screen. 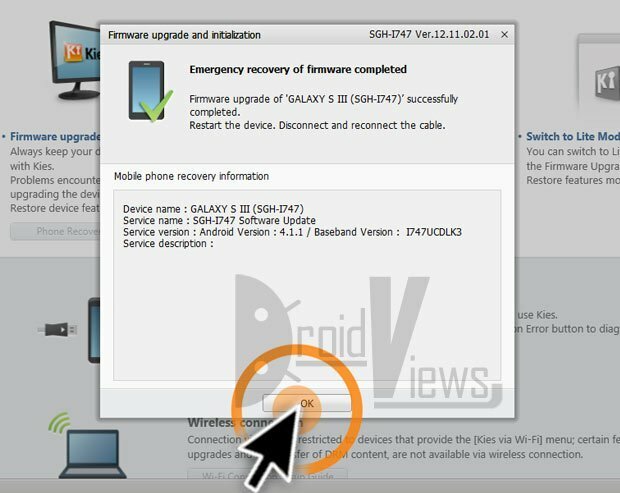 Doing this will force Kies to download the require firmware update files for your device. Respond and confirm all securities warnings to clear the way for emergency firmware installation and then select Start Upgrade. Kies will now start downloading firmware files and the process might take several minutes depending or data connection speed. Click on OK and disconnect the cable. Reboot your device and done! Your Galaxy phone or tablet should not boot normally and then you will feel a great sense of relief. Enjoy and cheers! This Guide Didn’t Help You Out? (The tutorial works with all Galaxy devices though the title says it is for Galaxy S4. Just download the correct firmware file for your device and follow the steps). Kies says that It says that it cannot connect, I cant find the right code for odin. Ive tried idk how many. I cant get back to reboot scren. The only two things that I can get are download screen and the firmware encountered an issue screen I have even tried to manually enter my sn and model number into kies manually but since my tablet is dead and will not charge anymore, this way did not work either. I am this close to smashing it with a hammer, but i thought i would ask first…. CAN ANYONE HELP ME PLEASE!!!! Its not just a tablet to me. Im a full time student and I take between semester courses online, and i do not have money to buy another one. Mine is a samsung galaxy 8.0. I have not been able to find anything for odin that is for jellybean, so idk if that is my problem. Another issue is that on the inside of my it says GT-n5100, but when i put that into kies it says that it does not match my sn; however, when i put GT-n5110, it tries to upgrade, ,but says it cant because the pc does not recognize my device because its dead i guess. Also, when i try odin, on the download screen it also says GT-N5110 sometimes. I do not know what to do besides get out the hammer and make myself feel a little better. It says my phone is not supported I have a Samsung grand prime SM-G531H, I dont know what else to do, ¡¡please help me!!! I cant do it with odin either cuz it fails with a file called WRITE. Kies said this model is not supported…please help..! STEP NO.11 DID NOT CAME. i tried to follow the steps that you provided, however, my phone doesn’t have the serial number, and this is a remanufactured phone i got while i had my previous phone under warranty, so i don’t have the packaging either. i’ve chatted with samsung on another way to get access to the s/n, but to no avail. do you have any other options to try…besides having to replace the phone! i got the above message on my original samsung note SGH-I717. thank you! I can access download mode but Kies states my device does not support initialization. Do i need to be in download mode for kies to work? how do i get off the screenshot from above? Are you able to access download mode? Download mode cant be accessed..its just stuck on that message..Any help sir?..I would gladly appreciate it :)..
i tried odin it says fail then in kies tells me the s/n dont match when i got from under the battery ??????????????? What error message you see in Odin? Is USB Debugging enabled on your phone? Kies keeps asking for a recovery code for Emergency Recovery. It does not show me the code needed. Please Help, I have tried this more than 3 time on two computers. hi i hav a problem with my s2.i tried to flash official firmware through odin but odin is not responding. cannot flas my official fimware,kernels.wht should i do?? Hi im having this same message, It comes and goes as it pleases , power, recovery, or odin mode wont come on. Will these steps still help me at all? please help…….. i upgraded my samsung galaxy tab 2 p3100 using Odin but while upgrading it, i accidentally pulled my usb connector from my tab…. i can’t turn on my tab anymore and “firmware upgrade encountered an issue. 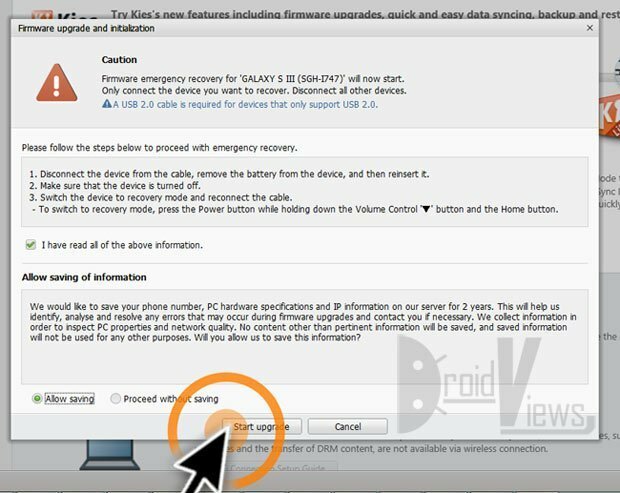 please select recovery mode in kies and try again” is shown in the screen. can anyone help me please? Either follow the steps frpm above or retry installing the firmware. Then go the Odin way. My device does not stay on… and shows that message when it comes to life for some reason… then I tried to use Odin and the device is detected, but Odin can’t conclude it’s job… cause the device turns off again… when I tried Kies the message shown was: “does not support initializing” and when I try to get to the “download mode” on the device it says: “low battery. Can’t download”… My batery is fully charged… I don’t know what else to do and I need my cellphone, wich by the way is a Galaxy note “GT-N7000”. can anyone help me, please? this message appeared: “firmware upgrade encountered an issue. Please select recovery mode in kies & try again,” and the screen looks exactly like the 1st screenshot above. Now my computer will not recognize my phone when I connect my tablet to my computer! Okay, try the guide I gave you link to. I have this problem when I follow your steps. I forgot to back up my data for my Samsung Galaxy Tablet and forgot to enable the “USB Debugging” box. I then began rooting with ODIN on the SAMSUNG 10.1 P5113. After I began running ODIN I received an error message on my tablet that said Firmware upgrade encountered an issue. Please select recovery mode in kies & try again,” and the screen looks exactly like the 1st screenshot above. Now my computer will not recognize my tablet when I connect my tablet to my computer! Please assist me with this issue! What should my next step be? I thank you for taking the time to read this! how long does it take to download the firmware upgrade ? the download is taking too long in my calculation it may take 8hours to finish the download..
Make sure you have a fast Internet connection. Mr. Rakesh, I cannot enter the recovery mode. Every time I press the volume up and down and the power bottom at the same time, the Firmware upgrade encountered shows again. What can I do? My phone is galaxy note I717. The key combo for recovery mode is volume up+home+power. Hi Rakesh, I hope that you are still around and this will reach you. My daughter was given an hand me down SGH-i717 from my step-father and she wants to sync it with her iTunes and be able to take video on it and upload it to her Macbook. And Download Begins, and continues….and continues…and there’s no updating of any kind to let me know it’s process, or if it’s even still underway. Any help? I appreciate it. Using updated version of Kies as of yesterday, running Mac with Yosemite updated. Hi, I just got my first MacBook Pro and am still trying it. Did you try flashing the stock firmware using Heimdall? Thanks a lot for the reply! Turns out, that it had updated firmware I think. I tried a different cord, which took me a while to find, and suddenly it connected. I put Kies back on and it worked like a charm and said no updates needed. But, it’s got 4.1.2 or something on it, isn’t the current 5.1 or so? 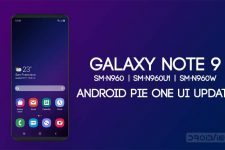 The latest version for Samsung devices is Android lollipop (5.0 and above) but your AT&T Galaxy Note is quite an old device and the latest version released for it is JellyBean (4.1.2). Please help me! It says, “GT-P6200 does not support initializing”. I can’t use ODIN mode, Recovery mode, and also every time I tried factory reset, same error! What should I do?? !!!!!!! I nearlyy killed my self by watchin that screen on my device!!!!!!!!!!!! Pheeewww i am happy that now it works good!!!!! cmriech What is your device model? You can’t do anything till you provide iCloud details. iPhone has strong security measures. Try getting the registered email and password from the old owner. rakesh plz help me .am from bahrain… my galaxy note gt n7000 also same problem showing (GT- N7000 Doesnt support initializing)..what shld i do for this?? OKAY ı dıd ıt. but the problem is that it saysthat kies doesnt support your devices ? wht can l do ? Rakesh I tried every single methods available but failed and was preparing to get RIFF JTAG CABLE as my last option but then I thought might be kies is the culprit behind it who gave me not supported error. So I left my lappy and switched to my dad lappy and connected my phone in recovery mode and my dad lappy didn’t have kies. I then used odin 3 old version and waited until it showed com 17. Then tried to flash android 4.3 and for first try I failed but on second try it worked. But then Rakesh thanks for immediate response. It doesn’t change anything? theres still the same error i had before doing this.pls help. Which model of S4 do you have? I have a question, hope someone answer me. If i connect my device to the computer, is is in the screen with the Firmware upgrade encountered an issue. Please select recovery mode in Kies & try again. sign? Please help kies does not respond to emergency firmware upgrade and initialization process!! upgrade encountered an issue” please select recovery kies….etc. Now when I use kies (kies version 2.6.0.13091_9 ”fully-updated”) the process fails after the following steps/process. 1.Kies starts downloading firmware update components. 3.Kies screen shows downloading upgrade components. 4.A notice Kies window abruptly shows up a message in unrecognizable language. 5.pressing OK button does nothing,simply closes the process and it shows the kies home screen trying to connect but nothing happens. Does your phone have a firmware meant for a different country? Install the firmware using Odin. but please before i did that i lost my photos is there a way to retrieve them ?? Because the data is formatted during reset, I am afraid you will not be able to restore the lost photos. Rakesh, I got the same error screen on my S4 now.. I tried flashing with latest 4.3 Firmware and old 4.2.2. I was not able to flash via odin and its failing. As said in the post I followed.. Kies taking HELL lot of time for this. Any other option to recover my phone??? 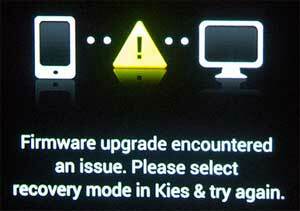 Your device will only recognize Kies when this error occurs, so there is no other way. Hi. After I start the upgrade (step 9), something pops up either written in an foreign language or some random signs, and it just shuts Down. What can I do? I have an Galaxy s2. That may be some security alert or warning. Do you see any options/buttons too when that appears? Yes, it said ‘confirm’, so I did, but it just shuts down after that. There are no other options/buttons. If you get stuck I’ll try to help. I am trying to undo the 4.1.2 upgrade and go back to 4.1.1 on my galaxy S3 SGH-1747, but when I try to download version 4.1.1 and extract it to my computer as it says in this guide I get this message “This file is either removed due to copyright claim or is deleted by the uploader.” Is there another place where I can download this firmware from? Thanks in advance for your help. Thank you for replying, but I am afraid that the link doesn’t work. Tried on my Galaxy S3. Kies told me that my Serial Number couldn’t be verified, and therefore shut the process down. 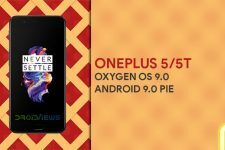 where did you download the 4.1.1 firmware from?